You can sideload apps in your organization using cloud-based deployment so that apps are available to any device with Internet access. Sideloading an app by using Windows Intune is similar to doing so through System Center Configuration Manager. The biggest difference is that the deployment services are cloud based and available to any device that has Internet access. Windows Intune can only deploy apps after operating system deployment. Currently, Windows Intune does not support operating system deployment scenarios. The prerequisites for using Windows Intune to sideload an app are the same as for all other sideloading methods for Windows 8. For Windows RT, Windows Intune also supports the ability to manage certificates and sideloading keys. For more information, see Prepare to Sideload Apps earlier in this guide. 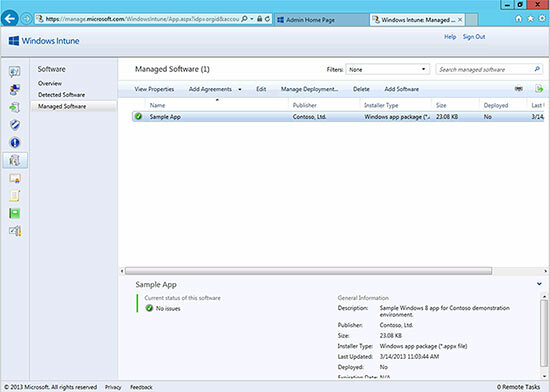 You can use Windows Intune only or integrate Windows Intune with System Center 2012 Configuration Manager with SP1 by using the Windows Intune connector, which allows you to manage your apps by using the Configuration Manager console. For more information on integrating Windows Intune with System Center 2012 Configuration Manager with SP1, see How to Manage Mobile Devices by Using Configuration Manager and Windows Intune. Before you can deploy (sideload) your app to Windows Intune–managed devices, upload the app into Windows Intune. 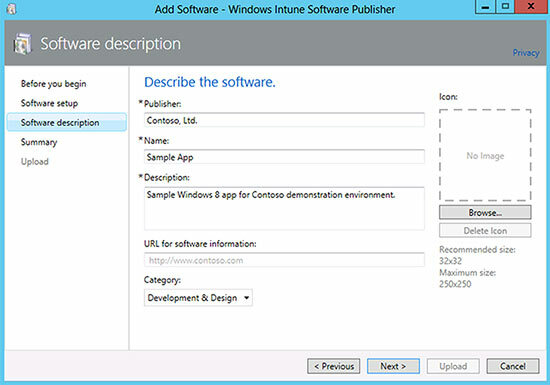 Click the Step 1: Add software hyperlink in the Windows Intune Software workspace to upload software into Windows Intune (as shown in Figure 1), which starts the Add Software Wizard. On the Software setup wizard page, select the Windows app package software installer type and the local or Universal Naming Convention (UNC) path to the application (as shown in Figure 2). This process is similar to creating an application in System Center Configuration Manager. On the Software description wizard page (shown in Figure 3), specify the publisher, user-friendly name, and description of the app. You can optionally specify a URL for more information about the app and select a category for the app. When the Add Software Wizard is complete, the app is listed in the Managed Software node in the Software workspace (shown in Figure 4). Now, the app is ready for deployment to users and devices that Windows Intune manages. After the app is uploaded into Windows Intune, you can deploy it to Windows Intune groups. Windows Intune groups are similar to System Center Configuration Manager user and device collections: They can contain users or devices that Windows Intune manages. Click Manage Deployment in the Managed Software node in the Software workspace (as show in Figure 5), which starts the Deploy Software Wizard. Windows Intune supports deployment of Windows Store apps to users only, not to devices. The Select Groups wizard page (illustrated in Figure 6) allows you to select the Windows Intune groups to which you want to deploy your app. You can base Windows Intune groups on a list of users and devices that Windows Intune manages or on security groups. In the example in Figure 6, the Marketing Windows Intune group was created based on a security group with the same name. This means that the app will be deployed to all members of the Marketing security group. On the Deployment Action wizard page (illustrated in Figure 7), select the appropriate installation approval for the app. To install the app, you can select Available Install or Required Install from the Approval list. The Available Install option makes the app available to the user, who can then elect to install the app. Windows Intune supports the self-service model of deploying apps. It does not support pushing apps to users. When the Deploy Software Wizard is complete, the app appears in the Windows Intune Company Store. Users will be able to deploy the app to their devices directly from there.